KHUNAMI KHOP - "ARMENIAN "FOOL THE IN-LAWS" DESSERT. 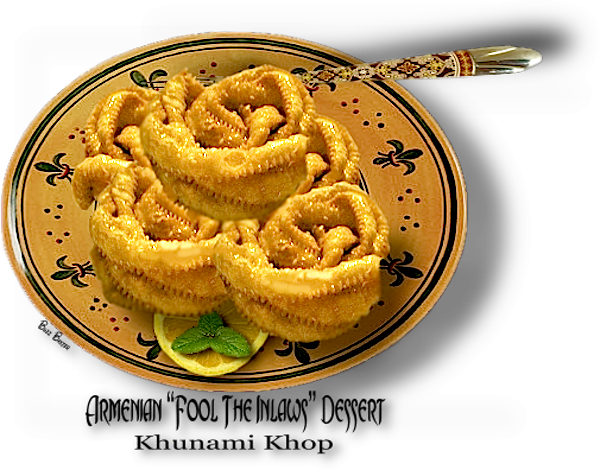 This is a dessert made by Armenian families to impress the parents and family of the young man or woman who was considering marriage to their son or daughter. When I was a kid growing up, my mother used to make this as a holiday dessert along with many other desserts for Thanksgiving and Christmas. They looked a lot bigger then, but of course I was a lot smaller then. Trying to impress your in-laws (Khunami) or future in-laws was quite a daunting task for Armenian families. Trying to make a big show with little expense was the secret in having the parents or your future daughter-in-law or son-in-law over for dinner, to meet the family. This sweet dessert really fit the bill. A small amount of dough with sweet syrup or honey drizzled all over it would really impress, especially when that little piece of dough would expand into a very large elaborate looking dessert that was pleasing to the eye, but gentle on the pocketbook. Thus we "Fool the in-laws" into thinking that their son or daughter will be marrying into a very prosperous family. A family that could afford such a large showy dessert. 1. Beat the egg whites until they are stiff and peak. Add the egg yolks to the whites and beat again. Add vanilla, tablespoon of oil and baking powder to the egg mixture. bowl and let stand for one hour. 3. Take each ball and spread out as thin as possible. Cut the dough into one inch wide strips. 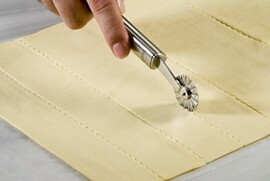 Keep turning the fork so as to brown the curl on all sides. Be careful to stop when curl is a light golden brown. Repeat the process until all the strips are done. sugar-lemon syrup or honey or dust with powdered sugar and serve. sugar or drizzle honey over the curls instead of the syrup. You can avoid making the dough and buy shortcrust pastry dough from a good supermarket.